A police sub-inspector, who was critically injured in exchange of fire with suspected SIMI cadres in Nalgonda district last week, succumbed to his injuries on Tuesday even as combing operation to nab more members of the banned outfit continued for the fourth day. D Siddaiah, who had suffered four bullet injuries in the incident and was undergoing treatment at a private hospital in Hyderabad since Saturday last died this afternoon, a senior police officer said. “It (death of the SI) is unfortunate,” Nalgonda SP Vikram Singh Duggal told PTI. Siddaiah was the second casualty in the shootout that occurred in Janakipuram of Nalgonda on April 4. Police constable K Nagaraju was killed on the spot during the encounter while circle inspector Bala Ganga Reddy was injured. The encounter occurred when Mohammed Aijajuddeen and Mohammed Aslam, who were active members of banned Students Islamic Movement of India and involved in a string of terror acts including triggering of bomb blasts across the country, were being chased by police. 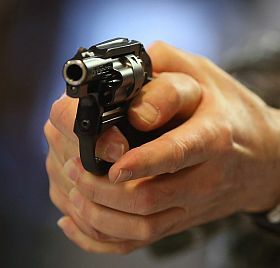 The duo was on the run after opening fire on a police team in Suryapet of Nalgonda on April 2 in which a police constable and a home guard were killed and three others were injured. The SP said the combing operation continued on Tuesday also to nab the other accomplices of the slain duo, who are believed to be hiding in Nalgonda district. “Search operation is continuing...we have to ascertain (on the suspects)...they may or may not be there,” he said. Elite Organisation for Counter Terrorist Operations and Greyhound personnel are combing to flush out the accomplices of the duo also part of the group of seven undertrials who had escaped from Khandwa jail in October 2013. Meanwhile, Telangana Chief Minister K Chandrasekhar Rao has expressed grief over the death of Siddaiah and ordered to hold the slain policeman's funeral with full official honours. Rao has also expressed anguish over the efforts of doctors to save the life of Siddaiah not succeeding, a release from the Chief Minister's Office said. Hailing the courage displayed by Siddaiah, the chief minister said he will be a source of inspiration for not policemen alone but citizens as well. All the policemen who lost their lives in the exchange of fire, along with Siddaiah, had a brave death, the release quoted Rao as saying.